Why buy a Degu from the breeder ? Many shops now offer a comprehensive service for food, entertainment and dealing with degus, but most degus come from so-called mass breeding. There the animals are kept in too large groups into the tightest spaces. Socialization is, as with any animal, very important and is practiced only insufficiently or not at all by the breeders. The inbreeding in such establishments can not be entirely ruled out, which affects the health and life of the animal. An unbalanced diet in adolescence, the unnatural light, the knocking on the window Child and the resulting fears or psychological damage can be a problem later in life of degus. Many owners give as a result their degus the shelter from because they are too wild or snappy. The purchase of degus from a breeder includes not only a chance to visit the parents, but also to get the living conditions of the first weeks. One can his new companion search of small and watch him grow up in the first 7 weeks. The pairings are carefully selected and the living conditions are always visited with reputable breeders. Socialization takes place from the first days and the health of the boy is checked regularly. Also, the desire for a particular color are more satisfied than in a pet shop here. As a breeder it also represents a focal point for future issues to Posture / nursing / and nutrition. Where are my pets from? German ARD political magazine "Report Mainz" and the German news magazine "Der Spiegel" ( 14/04/2015 ) . Known pet shops and retail stores on investigation. As with any species, it is important carefully choose the matings to obtain a healthy and strong line and prevent genetic defects. Therefore, no Degu is used for breeding of which the pedigree is not known. 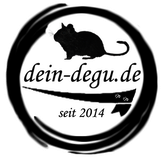 To maintain genetic diversity bring the hobby breeders not only from Germany new degus to but also from neighboring countries. The networking of farms is therefore particularly important to counteract to a possible mating with related degus. By following these principles, we are able to establish some healthy breeding lines and so be able to control the color breeds better.